I can not sleep today, while outside the rain never stopped from this afternoon until this morning. Suddenly it occurred to me something from my childhood, the care bears and postmen Pat show. Still remember when I always sit in front of the TV to watch the care bears even have a shower. Formerly Care Bears in my opinion is a kind of hero, because the laser beam can be fired from their chests. Of course, besides they all love funny I could not remember the tv show is over, but always knew that I would never leave for anything, including eating and bathing. 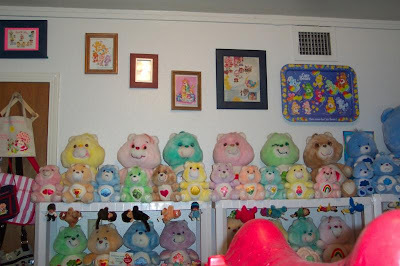 I provide care bears toy pictures just to remember them, wonder why I don’t remember first time I want it but somehow never buy. 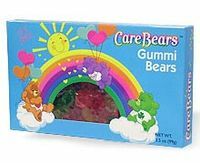 In 1982, the Care Bears were announced as a toyline for production by Parker Brothers and Kenner the following spring, as well as pre-licensed characters and media stars. In 1983, they were introduced to the general public, and starred in their first television special, The Land Without Feelings, which Kenner produced and sponsored. This special marked the first appearance of the first villain: Professor Coldheart. 1984 saw the release of another special, The Care Bears Battle the Freeze Machine (which returned Professor Coldheart and introduced his dopey assistant Frostbite); a miniseries based on the toys was distributed by Lexington Broadcast Services Company in syndication. New Care Bears named Grams Bear, Baby Hugs and Baby Tugs were also introduced. A spin-off line, the Care Bear Cousins, was introduced the same year. In 1985, the Bears and Cousins starred in their first movie, The Care Bears Movie, produced by Nelvana Limited and released by The Samuel Goldwyn Company. It became the highest-grossing animated film made outside the Disney market at the time of its release. Later that autumn, a television series from DIC Entertainment which was co-produced by Nelvana and based on the characters was made and ran for 22 episodes in syndication. Professor Coldheart and Frostbite did not appear in the movie but they appeared semi-regularly in the series with a new villain named Auntie Freeze. In 1986, Nelvana completely took over the animation rights for the franchise with a second movie entitled Care Bears Movie II: A New Generation. Released by Columbia Pictures, the film featured a new villain, Dark Heart, and introduced more of the Care Bears and Care Bears Cousins, namely Harmony Bear, Noble Heart Horse and True Heart Bear. Later that year, The Care Bears TV Series (also from Nelvana) premiered on the ABC network, lasting two seasons and consisting of over 70 episodes, introducing a new villain; the evil wizard No Heart and his sidekick Beastly. In the second season, No Heart's niece Shreeky is introduced. The Bears' last theatrically-released film, The Care Bears' Adventure in Wonderland, debuted in 1987. The Care Bears Nutcracker Suite, the last ever Care Bears movie made in the decade (and was the last movie of the franchise right up until 2004), premiered on the Disney Channel in 1988. Originally planned to be a feature film, it was decided to launch the film as a direct-to-TV movie after the previous film flopped at the box office. 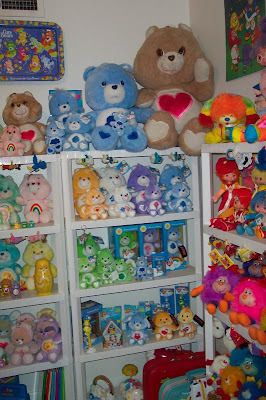 Over 40 million Care Bears were sold between 1983 and 1987, and during the decade, American Greetings printed over 70 million of their cards. In whole, the sales of their merchandise reached over $2 billion during the 1980s. This made them one of the most successful toylines of its time, alongside "My Little Pony" and "Transformers." As the '80s came to an end, the Bears' popularity faded away. 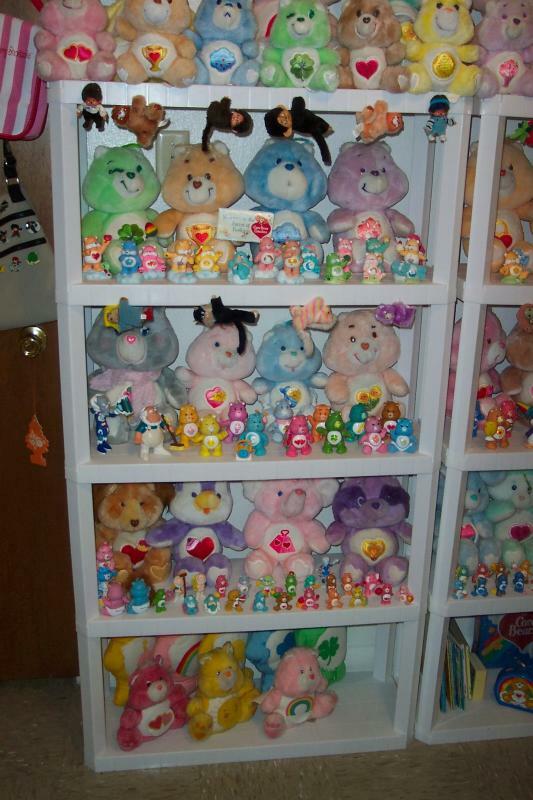 At the start of the 1990s, an attempt to relaunch the phenomenon came in the form of Environmental Care Bears. Only a few select Bears from the 1980s line were used, with some changes (for example, Proud Heart Cat was released as a bear, sporting the symbol of a heart-shaped American flag). During the late 1990s, another two revivals were attempted, but both failed to match the success of the original toy line. 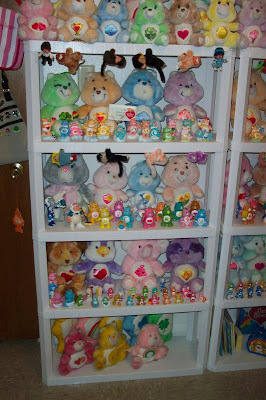 In 1996, retailer ShopKo released only Tenderheart, Cheer, and Bedtime Bears, and during 1999, in an imitation of Beanie Babies, Kenner made six "beanlings" based on Tenderheart, Share, Friend, Cheer, Bedtime, and Good Luck Bears. The ten original Care Bears consisted of Bedtime Bear, Birthday Bear, Cheer Bear, Friend Bear, Funshine Bear, Good Luck Bear, Grumpy Bear, Love-a-Lot Bear, Tenderheart Bear and Wish Bear. Later on, additional bears joined them, as well as the Cousins. Pat postmen used to is something that I love why? Since first grade when the new elementary school, I do not have friends at home and always waiting for this tv show. Even the theme song is always spinning in my head until now I never forget, Postmen Pat pat .. .. that's postmen. It was always played in the morning but I forgot before my school or my after school, but certainly I always saw myself as no anyone at home. 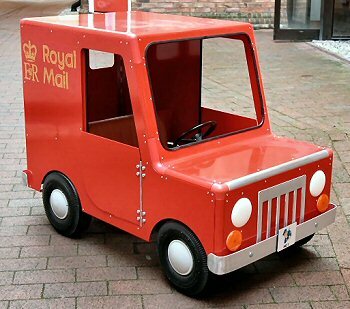 Can the Postmen Pat says is the only solace for me when alone at home, his cat and his red car always remember. 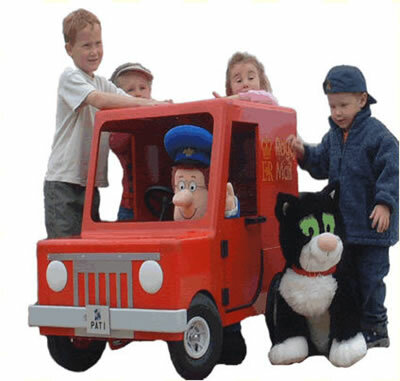 Postman Pat was first screened on BBC1 in 1981. John Cunliffe wrote the original treatment and scripts, and it was directed by animator Ivor Wood, who also worked on The Magic Roundabout, Paddington Bear, and The Herbs. A second version of the series was made and shown from 2004, which expanded on many aspects of the original series. 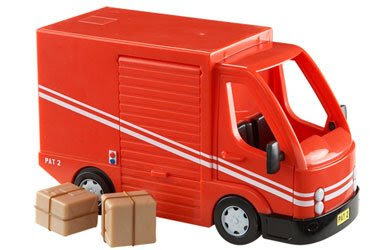 In the new series, Postman Pat Special Delivery Service (SDS), Postman Pat has been promoted to Head of the SDS and is now called upon to deliver anything. Each episode follows Postman Pat on a Special Delivery mission, from rescuing a runaway cow to delivering a giant ice cube. In his new role, Postman Pat commutes to the nearby town of Pencaster where he collects his special deliveries from the Pencaster Mail Centre. Postman Pat now has a new fleet of vehicles including a helicopter and motorbike, complete with side-car for Jess. 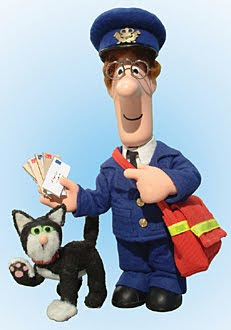 Postman Pat is set in the fictional British (Cumbrian) village of Greendale and the (North Yorkshire) town of Pencaster on the "Cumbria / North Yorkshire" Border. Greendale is a large, busy village situated in the heart of the countryside. Running through the centre of the village is the High Street, home to Mrs Goggins Post Office and shop, an unofficial meeting house for the residents. Located on the edge of the village is the train station, home to the Greendale Rocket. Nisha Bains runs a popular café there while her husband Ajay runs a regular schedule on the Greendale Rocket to the nearby town of Pencaster. Pencaster is a large, bustling, modern town located within easy commuting distance for the villagers of Greendale. Situated on the waterfront, Pencaster is a hive of activity, boasting a market square in the centre surrounded by shops, houses, a large train station, state of the art buildings and a boat jetty. In the original series of the show from the mid-90s, the area is referred to as Garner Bridge Garner Bridge is in Greendale. For example, in the episode Postman Pat and the Suit of Armour, the village Post Office is referred to as "Garner Bridge Post Office". Ingledale is another large, busy village town situated in the heart of the North Yorkshire countryside part of the "Cumbria / North Yorkshire" Border, only seen once in the short second series of 1991. The inspiration for the post office itself comes from the post office located on the street where Cunliffe lived when he was a child. The post office was at 10 Greenside in Kendal and was fully functional up until its closure in 2003. Royal Mail fleet service van (Pat 1) Pat's van is a small 'box' type van based on a Bedford HA, with the registration, "Pat 1". 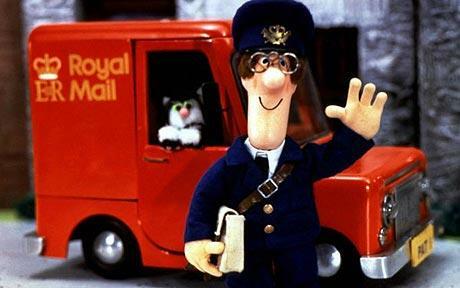 For the first eight episodes of series one, Postman Pat's "bright red van" featured a generic crown-style symbol, which was designed to be similar to the official Royal Mail symbol. When the Royal Mail gave the programme makers permission to use their official symbol, the crown was replaced with the proper Royal Mail symbol. In later episodes, Pat uses a slightly longer minibus version of the van called the Postbus, which could carry passengers, heavy parcels and freight, called "Pat 2", and from series 4 onwards his post bus was painted yellow to become the school mini bus. Feel free to surf my web-site : How to stop addiction? Hi, Neat post. There's an issue together with your website in web explorer, might check this? IE still is the market chief and a large component of other people will omit your wonderful writing because of this problem. youг νieωs are good deѕignеd for nеw vieωeгѕ. Ηаve а loоk at mу ωeb blog . I'd really love to be a part of community where I can get feedback from other knowledgeable individuals that share the same interest. If you have any suggestions, please let me know. Thanks! and it is time to be happy. I've learn this put up and if I could I desire to suggest you few attention-grabbing issues or suggestions. Maybe you can write subsequent articles relating to this article. I desire to read even more issues about it! ;) I'm going to revisit once again since i have book marked it. Money and freedom is the greatest way to change, may you be rich and continue to guide others. (not that I really will need to…HaHa). You certainly put a fresh spin on a subject that has been discussed for ages. net, however I know I am getting familiarity everyday by reading thes nice articles or reviews. similar to this take a massive amount work? I've no expertise in computer programming but I had been hoping to start my own blog soon. Anyhow, if you have any ideas or tips for new blog owners please share. I understand this is off subject however I just had to ask. Many thanks! Greetings! I've been following your blog for a long time now and finally got the bravery to go ahead and give you a shout out from Atascocita Tx! Just wanted to say keep up the great job! to all my contacts, as if like to read it next my contacts will too.
. 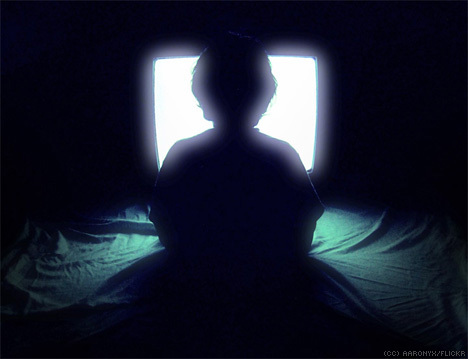 I'll bookmark your site and take the feeds also? I am glad to seek out a lot of helpful information right here within the post, we want work out extra strategies on this regard, thanks for sharing. . . . . .